Gabriela Sabatini, who won 27 singles titles in her career, also won the hearts of tennis fans around the world. One thing is for certain when describing tennis legend Gabriela Sabatini: She was exciting to watch. Undeniably talented, Sabatini had a style that was adaptable, varied and downright pretty. And just as impressive as her play was her ability to remain down-to-earth and exude a genuine humility and charm that only enhanced her public image during the peak of her career in the late 1980s and early '90s. Sabatini was discovered at the River Plate Club in her native Buenos Aires at age 8, and it didn't take long for her to make headlines. She was crowned the world No. 1 junior at age 14, and the next year, 1985, she became the youngest player to reach the semifinals at the French Open, where she lost to Chris Evert. With her extraordinary one-handed backhand, her exquisite volley and her ability to play an all-court game, she achieved success and won over fans as if it were simple to do so. That's what the special ones do. They make the hard things look easy. And boy she was good at it. Before she turned 20, Sabatini already had reached the semifinals of all four Grand Slam tournaments -- something no female tennis player from Argentina had done before or has done since. 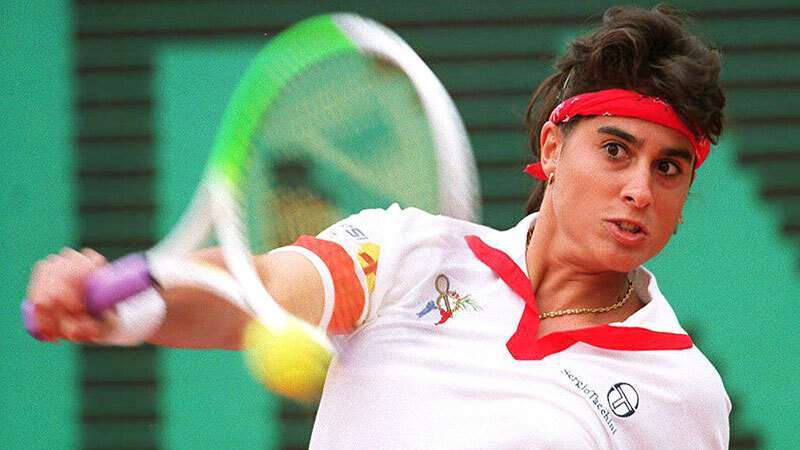 And she achieved another feat that has yet to be repeated by an Argentine woman: winning a singles medal at the Olympic Games, when she took home the silver in Seoul in 1988. Two years later, she reached the summit of her career by winning the 1990 US Open, her only singles major, by beating Steffi Graf. In doing so, Sabatini, who was voted the sixth-most-influential Hispanic female athlete of all time by a panel of blue-ribbon voters assembled by espnW and ESPN Deportes, became one of the most famous Spanish-speaking athletes in history. The year after winning the US Open, she came close to achieving an even greater accomplishment. Ranked No. 3, she came within two points of beating Graf in the 1991 Wimbledon final. Had she won, she would have become No. 1, but the opportunity slipped away in a matter of minutes when Graf turned her mental strength into her strongest weapon and prevailed 6-4, 3-6, 8-6. Sabatini and Graf had previously joined forces to win the Wimbledon doubles title in 1988. The charismatic Sabatini won at total of 27 singles titles and reached the finals of three Grand Slams. Looking back, New York was, is, and will continue to be her chosen city. It was there, in addition to winning the US Open, where she twice won the end-of-season WTA Tour Championship at Madison Square Garden, in 1988 and 1994. Two years later, in 1996, she chose to announce her official retirement at the Garden. The 26-year-old was showered with hugs and kisses from fans, many with tears in their eyes. Wins and titles are achieved when a set of factors come together: natural ability, effort, perseverance and mental toughness. But recognition at the personal level is a special bonus. And for that, Sabatini was respected everywhere. In the U.S., Italy and Japan, she achieved an unusual level of fame as a foreigner. She was sought after and admired by fans who gave her gifts and held up signs at her appearances. The same Sabatini, who was shy with the press, captivated all of her spectators and was made to feel like she was playing on her home court wherever she went. Some of Gabriela Sabatini's biggest moments came in New York, including winning her lone major at the 1990 US Open. Tired of crisscrossing the world and the constant pressures of the circuit, Sabatini walked away from the game in her prime. Now, at age 43 and with time to spare, she is relaxed and roams the world -- discovering new spots that she had never visited and returning to others where she had only the chance to see a club, a hotel and the tennis courts. She has dedicated herself to promoting her lines of perfumes and to working with various organizations to help children and the poor. She also spends time working on business and real estate ventures. Yet these activities are not well known because that is precisely what she wants -- to not publicize what she does or doesn't do. The same is true of her private life, of which little is known. Single and without children, she stays out of the spotlight. She transcended the borders of her country and her sport to receive numerous awards. She has worked on campaigns for UNICEF, UNESCO and the Special Olympics, and was inducted into the International Tennis Hall of Fame in 2006 and won the IOC Women and Sport Trophy that same year. Today she spends her days between Buenos Aires and Key Biscayne, Fla. The Argentine enjoys swimming and cycling and even participates in various races. Very close to her loved ones, she also enjoys spending time with family and has a special place in her heart for her two nieces. And she repeats that she is enjoying life "like I never have before, because I travel a lot, but by choice, because I like to. Getting to know different places and cultures broadens your horizons."